A simple, two-ingredient glaze makes this baked ham a snap to prepare and bake, and the contrast of the sweet glaze with the salty ham is classic. Serve the ham with pineapple slices or this Easy Pineapple Casserole. Scalloped potatoes and corn casserole are both excellent side dishes with ham... or choose greens, fried okra, or your family's personal favorites. 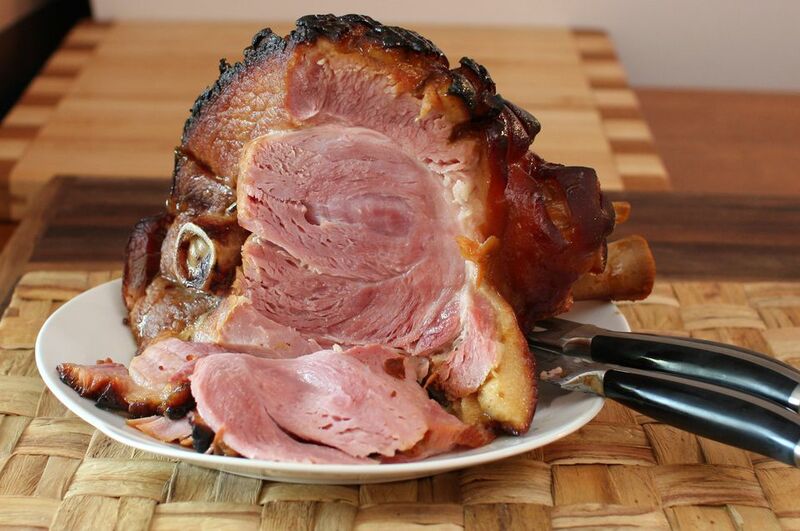 For a simple how-to, see these instructions for heating a fully cooked ham. Place the ham on a rack in a large baking pan or roasting pan with the fat side up. Score the ham lightly all over with a sharp knife, making a diamond pattern. Add 1 1/2 cups of water to the pan and cover tightly the whole pan with heavy duty foil. Bake the ham for about 18 minutes per pound, or to an internal temperature of 148 F.
Meanwhile, combine the preserves and mustard in a bowl, whisking to blend thoroughly. About 15 to 20 minutes before the ham is done, brush the ham all over with the glaze mixture. Serves 8, with leftovers. For an extra kick, add 2 tablespoons of peach liqueur (Schnapps), 2 tablespoons of lemon juice and a dash of cinnamon to this recipe. Use the meaty leftover ham bone to make a pea soup, your New Year's Day black-eyed peas, or use the meat in a casserole, quiche, or breakfast dish.